Visit our Kitchen showroom on Team Valley, Newcastle upon Tyne. We’re just minutes from the A1 at the Metro Centre side of the Valley. Parking is free and you’ll receive a warm welcome from our kitchen designers. Our kitchen planners will be delighted to provide FREE consultation and produce a 3D visual of your kitchen design. There’s absolutely no obligation to choose us and we don’t charge for our kitchen design service. Our Newcastle based design showroom showcases many of our top brand, modern and traditional kitchens, all available at unbeatable costs. Although our kitchens are cheap make no mistake the quality is superb. We manufacture our own kitchen units and sell only the finest quality kitchens from companies such as Second Nature kitchens, Browns and so on. Equally our appliances are great value, top quality brands such as Neff, Bosch, Siemens, whirlpool, AEG and Electrolux. So, how can we offer you such low prices for high end kitchens? Simple, by buying direct from the manufacturer you save money on your kitchen. There’s no need for kitchen offers or gimmicks, we’re simply able to offer unbeatable prices by keeping our overheads low and cutting out the middleman. Buy direct from the North East’s largest kitchen manufacturer to save money. Happy with your kitchen design and cost? Great. We can either supply or fully fit your kitchen for you. We will install your kitchen to the highest standards with as little disruption to you as possible. We only use the very best kitchen fitters and fully qualified electricians, plumbers and plasterers should you need them. Our Newcastle based kitchen factory is capable of crafting your new kitchen in just 2 weeks. We are regonised quality manufactures with many years of experience in delivering the very highest quality, designer kitchens at affordable prices. Please call us now on 0191 487 8900 or 0800 145 6552( QUOTING ‘Discount’ ) to arrange your free consultation. 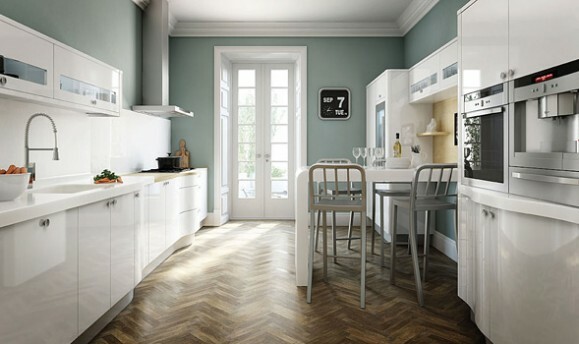 We have many new designs in modern and traditional kitchens, from white gloss to traditional solid oak, our quality and prices are unbeatable.